Bishop Jakob F. Isaac and Maria Dueck Isaac with sons Levi and Alvin, Meade, Kansas, 1941. Source:Centre for MB Studies (Winnipeg) NP139-01-71. Jacob F. Isaac: Kleine Gemeinde minister and farmer; born on 7 April 1883 to Abram P. and Margaretha (Friesen) Isaac, near Jansen, Nebraska, the fifth of eight children in the family. He was baptized and joined the church on 2 June 1901. On 10 November 1901, he married Katharina J. Friesen, daughter of Cornelius L. and Sara (Janzen) Friesen, in Jansen. The couple had 5 children. Katharina died on 30 July 1936, and on 6 December of that year, he married Maria Dueck, daughter of Heinrich R. and Katharina Dueck. The couple had two sons. Jacob died on 14 August 1970 in Meade, and Maria died on 10 March 1975. As a child, Jacob lived on a farmstead near the town of Jansen. In 1892, Jacob’s family moved to Colorado to look for land but returned to Jansen in 1897 because of a drought. Soon, however, a lack of land for young people to buy in Nebraska led community members to consider leaving for Kansas. The first migrants moved in 1906, and others followed in the next few years. Meanwhile, Jacob met and married Katherina J. Friesen and married her on 10 November 1901 in Jansen. The couple soon moved to a farmstead six miles (10 km.) from the town. In 1907, Jacob and Katherina joined others from the community in moving to Kansas, arriving at their new farmstead 20 miles (32 km.) from Meade on 9 March. No church had been built in Meade when Jacob and his family moved there, and services were held in a home at first. Later on, the Kleine Gemeinde congregation built two churches, one at each end of the town, with services alternating between them. After German instruction in schools was discontinued following the First World War, the church began to hold Sunday school classes to teach German to the children, beginning early in the 1920s. Jacob worked as a farmer, adapting his crops to the climate of Kansas, the drought of the 1930s, and the improved conditions in later years. In the fall of 1911, he was elected minister of the church in Meade, and in 1914, he became an elder. When members of the church began to consider immigration to Mexico after the First World War, Jacob was one of the delegates who explored the option, although he and his family stayed in Kansas. 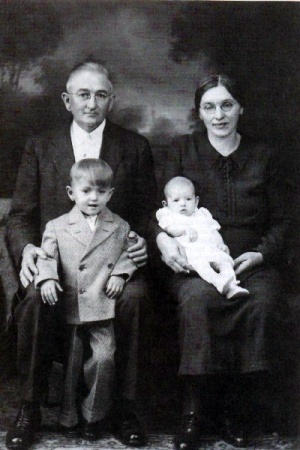 On 30 July 1936, Jacob’s wife died, leaving him with five children still at home. When Jacob later traveled to Kleefeld, Manitoba, to visit a church leader there, he proposed to the minister’s eldest daughter, Maria. Jacob and Maria were married on 6 December 1936 before returning to Meade. For some time, discontent had been growing in the church where Jacob was an elder, and people soon began to leave for other churches despite efforts at reconciliation and a series of revival meetings. Jacob was asked to resign as Ältester of the church but refused to comply, staying to conduct negotiations with a new group that had formed. Eventually, Jacob and his family all began attending the Emmanuel Mennonite Church, formed from the North church. Late in the 1950s, Jacob and Maria sold their land and moved into Meade, where they were joined by several family members. Jacob died there on 14 August 1970. Jacob F. Isaac was a dedicated leader whose commitment to the church helped him through some very difficult times. Despite the struggles in his life, he tried to remain true to his calling and beliefs, helping to set an example for others to follow. Loewen, W. Merle, Lee Isaac, and Al Isaac. “Ältester Jacob F. Isaac (1883-1970): The Last Kleine Gemeinde Aeltester in Meade, Kansas: Selected Writings, Personal Memories and Reflections from Relatives & Acquaintances.” Preservings 26 (2006): 46-52. Huebert, Helmut T. and Susan Huebert. "Isaac, Jacob F. (1883-1970)." Global Anabaptist Mennonite Encyclopedia Online. October 2009. Web. 20 Apr 2019. http://gameo.org/index.php?title=Isaac,_Jacob_F._(1883-1970)&oldid=95381. Huebert, Helmut T. and Susan Huebert. (October 2009). Isaac, Jacob F. (1883-1970). Global Anabaptist Mennonite Encyclopedia Online. Retrieved 20 April 2019, from http://gameo.org/index.php?title=Isaac,_Jacob_F._(1883-1970)&oldid=95381.